In my continuing search for clues about the origins of my Herndon women of Oxford, North Carolina, I decided to engage in some brute force analysis. I still only have been able to locate my Harriett in the 1900 and 1910 censuses. 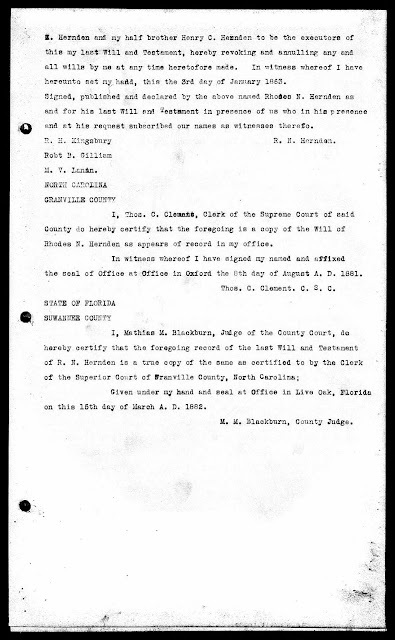 Based on these two documents, Harriett was born in either 1857 or 1865 (or somewhere in between). So she had to exist somewhere prior to 1900! I've run straightforward searches in the census databases for 1880 and 1870, but to no real end. She doesn't pop up in either. Ohhh what I wouldn't give for an 1890 Census! I've also hired a professional genealogist to do a few hours of digging. Unfortunately, that led to a dead end as well. So, I'm back to square one and have decided to go at this from another angle. 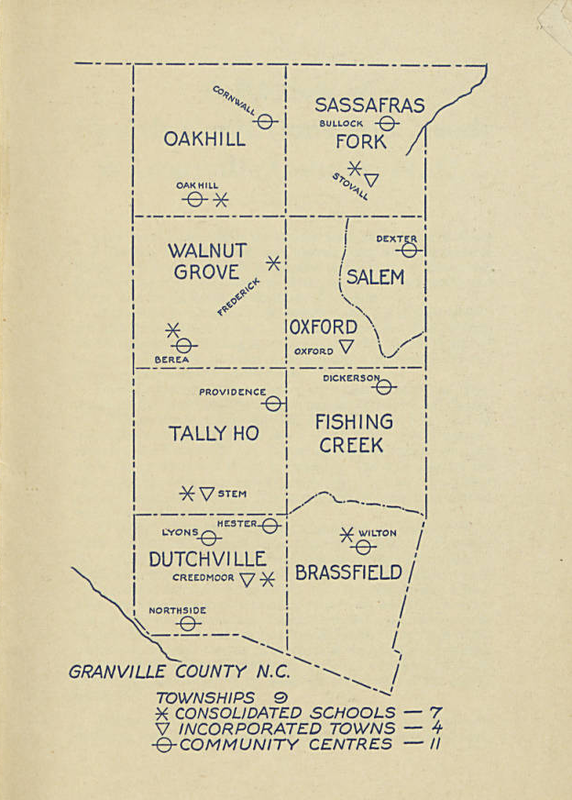 I created a spreadsheet that lists every Herndon in Granville County from 1860 to 1900. I had hoped that by analyzing this data I would find some clues and connections, but before I could get that far I stumbled upon something unexpected.....there was only one (1) Herndon family (listed on the census) in Granville in 1860, and they were white. After the end of slavery, beginning with the 1870 census, there were quite a few Herndons living in Granville, but all of them were listed as black or mulatto, with the exception of the one white family from the 1860 census. So what does that mean?!?! Could all or most of these people have been held as slaves by this one Herndon family? Indeed, I found these same Herndons listed as slaveholders in the 1860 census -- 38 people listed in all. They also were the sole Herndon slaveholders in Granville in 1850 -- 58 people in all. Up until now I had been proceeding under the assumption that this white Herndon family held my Herndon family, but it was just a theory. After this revelation I'm beginning to think that I should put more stock in this. I have looked into this family a bit, and they are....intriguing, to say the least. And I've been told that more than one of the clan took women, who were being held as slaves at the time, as their....lovers? mistresses? concubines??? Whatever you want to call the union; I just can't bring myself to believe that they were marriages or partnerships in any way shape or form....but perhaps I'm wrong. From what I've found so far, neither Rhodes nor Henry Clay ever married (but see the comments section of this post). They, however, were an economic force in Oxford's creation and growth; Rhodes more than Henry. I believe some of their other brothers -- and there were many -- also held land and slaves as well at some point, but in 1850 and 1860 I've only seen mention of Rhodes Nash, Henry Clay, John Randolph and Duncan C. Herndon. I did find the will of Rhodes Nash and was hopeful that my Harriet might be named in it. Unfortunately, she was not. She was born in a particularly difficult period, for my research purposes. She's too young to be identified by name in Rhodes's father's will (assuming she was a part of their plantation earlier) because Zachariah died in 1834. And she may not have been alive yet or may have been too young to have been listed by name is Rhodes's will, because he died in 1863. Labels: 1800s Goals mystery Oxford Research slavery Terminal Pt. Happy New Year! Blogging gives us the Opportunities to see where our holes are and where to go next! Happy Researching! Nia Jai, we are researching the same Herndon family! The "Bet" mentioned in Rhodes Nash Herndon's Will is my 2x great grandmother and Dr. Henry Clay Herndon is my 2x great grandfather! Rhodes was the first Postmaster in Oxford. Henry started the First Bank of Oxford, brought the Synchrony to town, along with the train station. The ROBERT L. THORNTON Library sits where Henry's home once stood. Bet's name was Elizabeth Cromwell Young (1838-1901) she and Henry had 4 children...Warren, William,John, and my great grandmother, Georgia Herndon Poole (1875-1934). I am trying to uncover the relationship between Cupid, Jenny, and Bet. I hope that Jenny and Bet are sisters and Cupid is their father. I have something that I am going to send you. I am excited! Laquetta, I am related to the other "Harriet Herndon" that Nia writes about. She appears to be the daughter of Rhodes and I believe that his half brother, William Gaston Herndon, fathered my great grandfather (One of Harriet's sons) William Herndon. So i th No we are related! Hello, cousin! Email me at jocelynarnold@gmail.commif you'd like to piece our connection together. Nia Jae I have great news for you! I have found Harriet! She was listed in the Inventory List for the Estate of Rhodes Nash Herndon (1795-1863)! I found this list in The NC State Archives over ten years ago! William G. Herndon bought George for $3000.00, Sandy for $2800.00, and Harriet for $1800.00! Congratulations Cousin! That is great news! Does it give anymore information like age or whether she was a young girl or child. My Harriett would've only been about 6 years old at the time of Rhodes's death. There is another Harriet Herndon, and she would've been about 16 at the time. And her first born child was named Rhodes Nash Herndon. I've been told that this Harriet was the daughter of Rhodes and one of his slaves. Dr. Henry Herndon was listed as her father. 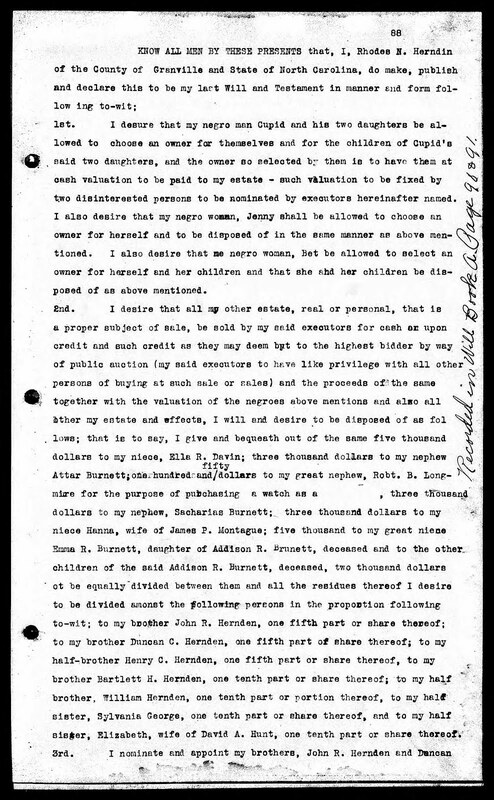 The informant was my grandmother, Johnnie Herndon Poole (1908-1951).Grandmother Georgia and her brother John were also taken care of in Dr Herndons will where she was given a safe with all of its contents, insurance money, quite a few blocks of land there in Oxford. 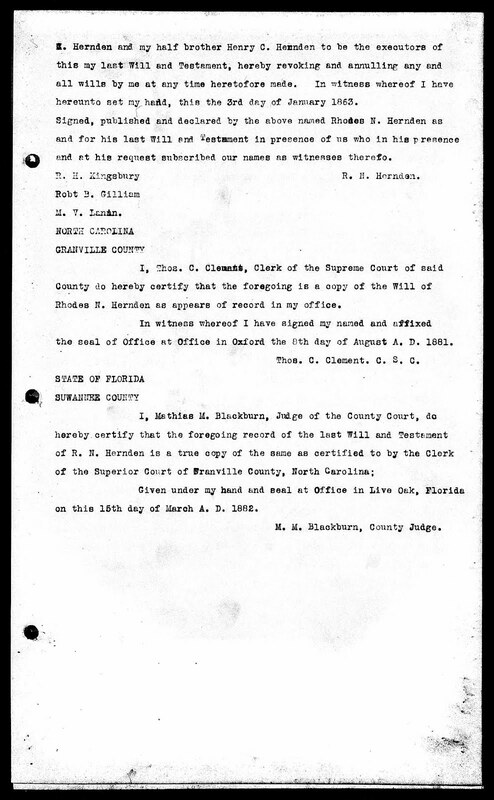 This was verified by obtaining the deeds to the land left to grandmother Georgia. Something that I found interesting was a deed where grandmother Georgia had given the land to which The First Baptist Church of Oxford now stands and she served as the piano and organ player for the church. Dear Ms Clark, Can you please tell me how to find the Inventory List for the Estate of Rhodes Nash Herndon that you mentioned above? 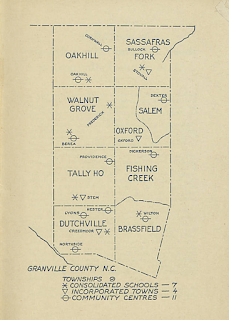 I am trying to help my cousin find the ancestry of his gr-grandfather James Herndon (aka Harrington) b. abt 1840, Granville Co, NC. and who escaped to the north circa 1863/64 to fight with the Colored Troops of Ohio. Thank you so much for your time. Hello, I happened upon your blog last night. I am a Herndon from Oxford and found your search for your Harriett. I have forwarded a link to my Aunts to see what information they have. 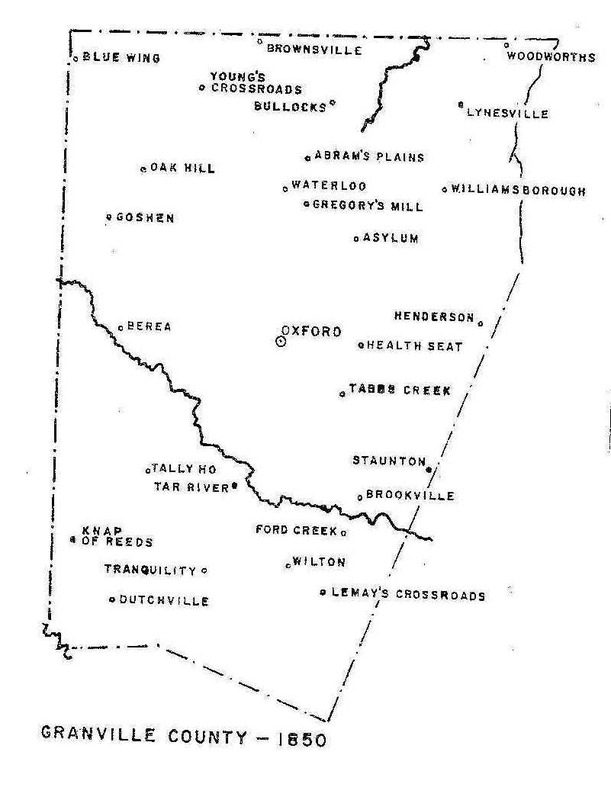 My great grandfather is Lurelle (sp) Herndon Sr. of Oxford. I don't know his parents names, however my aunt will as she has been tracing and keeping our family history. Hi Tatisha! Thanks for reading my blog post. I'm so excited to connect with you! Please email me so that we can continue to the conversation -- niajai@ -- the rest of the email address is my website railroadsandcotton.com. PS. First Baptist Church of Oxford, is my family church. Hi Tatish, I have been trying to contact someone at the First Baptist Church of Oxford to get the identification of some folks standing in front of the church in a picture I have. I have not been able to get an answer to my phone calls. I am the 2x great granddaughter of Dr. Henry Clay Herndon and Elizabeth (Bettie) Cromwell Young. 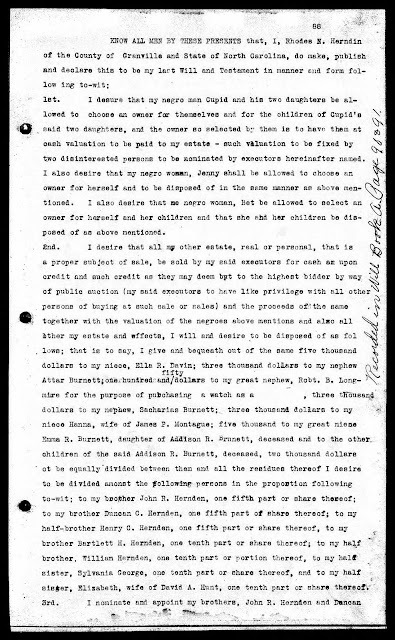 I have a copy of a deed where my great grandmother, Georgia Herndon Poole, gave the land that the church stands on today. I am searching for any information on those folks as well as my great grandfather, Hugh Allan Poole. I am grateful for any advice or direction that you can give. My name is Irishtine Herndon Cox, the daughter of the late Isaac Lee Herndon of Oxford, NC. Isaac father's name was Rell Herndon (I believe his name should have been Laurel Herndon) and Rell father's name was Isaac Herndon of Granville county. I spoke to my sister Dr. Elaine Herndon Yarborough who also doing research of the Herndon families of Oxford NC. We are the only Herndon as far as I know left in Oxford, NC. We also attend the First Baptist Church of Oxford which is now standing. I would like to know if we are related. My sister have history of Dr. Herndon and children. I also remember the Pools in Oxford, NC, some lived on Sycamore St and were our neighbor when I was growing up. Nia Jai, looks like we all have a piece of the story of the Herndon's of Oxford. Thank you. Hi Irishtine! The Pooles you mentioned, who lived on Sycamore Street, is my family. My mother, Myra Poole Cunningham, grandmother, Johnnie Herndon Poole, and some of the others I mentioned before lived there. My email address is readi316.lcn@gmail.Com I would like to explore our possible connection with you. Hi! My name is Irishtine Herndon Cox. heard), possibly a falling out occurred. It's my understanding that they lost contact with one another. I really don't know what happen to my grandfather’s sibling, but I do believe that they moved out into other areas. for instance, I met a set of twins who moved beside me in Durham, NC from the area of Fuquay, NC (Sally and Savanna Herndon) who favored my cousins, and when I first laid eyes on their father, he favor my father with those gray eyes. My sister Patricia said there was only one Herndon's Plantation in Oxford, and our ancestors came from that same plantation. I was also told that the Herndon's originated out of Herndon, VA. My other sister, by the name of Dr. Elaine Herndon Yarborough has done lots of research on the Herndon family also. I wish we all could get together the next time you're in the area of Oxford, so we can share interesting conversations. We all know Brenda Poole, one of the grandchildren who lived in the house on Sycamore St.